Approx. 800 kg per hour for peeling potatoes up to 2500 kg per hour for polishing baby carrots. The capacity is determined by the carborundum applied on the peeling rolls, the produce as well as the required peeling or polishing result. The Revolver Drum Peeler is most suitable for products with a small diameter of approx. 7 mm – 45 mm / ¼” – 1¾” such as baby carrots or pommes parisienne, but produce with a larger diameter, up to 75 mm / 3″, can also be processed. The products should be of a reasonable quality and have to be deleafed. 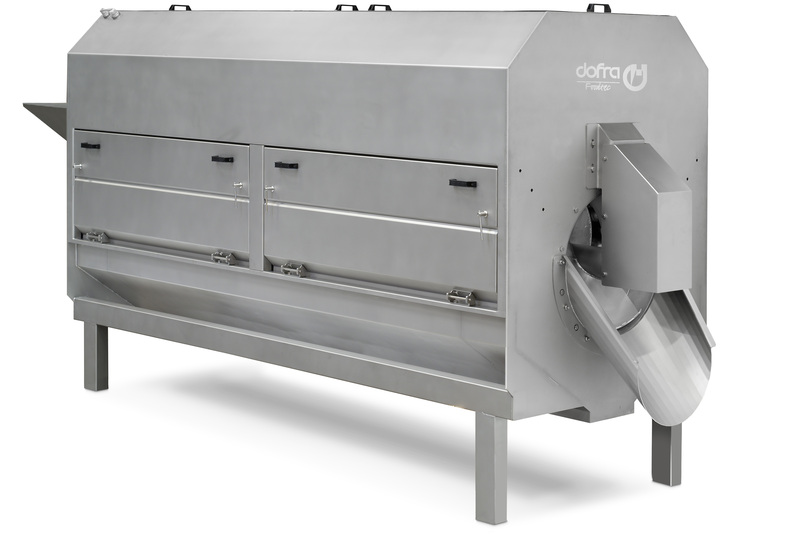 The Dofra RDP-2500 is equipped with 26 peeling rolls that have an abrasive coating specific to the produce to be peeled. The peeling rolls are mounted in a revolving drum which has a horizontal product screw. The speed of the horizontal product screw is adjustable. This speed determines the duration the produce remains in the peeler. Both the rotation speed of the drum and the rotation speed of the peeling rolls are adjustable to achieve an optimal peeling or polishing result. The RDP-2500 is equipped with water spraying nozzles on the product screw and can optionally be equipped with nozzles on the outside of the abrasive rollers.